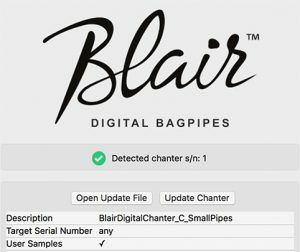 The Blair Digital Bagpipes PC app is used to load information into your Digital Chanter. Firmware is the engine of your chanter. The latest version is 1.08 and includes Stereo Pan, Battery icon change, Metronome Pan and management for installing additional sound banks. This firmware is also included with the C Scottish Smallpipes file. 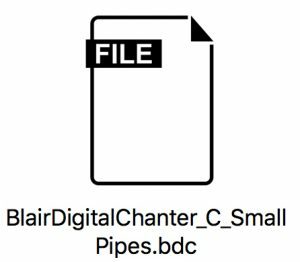 This ‘.bdc’ file contains instrument information and loaded into your chanter via the PC app. It is prefixed ‘.bdc’.